Despite performing below expectations on his seasonal reappearance at Cheltenham’s November fixture, Rebecca Curtis’ talented Teaforthree has been installed as the 7/1 ante-post favourite in the horse racing betting for the gruelling Welsh National. A seriously progressive staying chaser last term, the eight-year-old beat the very useful Restless Harry in heavy ground at Chepstow last December over three miles before finding the sharp Kempton circuit and much quicker conditions all against him when trying to mix it with Grand Crus in the Grade 1 Feltham Novices Chase at Kempton Park on Boxing Day. 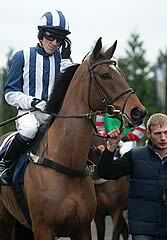 After racing prominently until the 12th fence, the gelded son of Oscar faded quickly and was tailed off when pulled up by Tony McCoy before the third last. Returning to Chepstow for a confidence boosting run back on testing ground, Teaforthree hacked up by nine lengths from Roalco des Farges and then journeyed to the Cheltenham Festival where the marathon trip of four miles brought his undoubted stamina into play. Under a great ride from the top-class amateur JT McNamara, Curtis’ out-and-out stayer ran on bravely up the Prestbury hill to see off the talented Harry The Viking to win the Diamond Jubilee National Hunt Chase by two lengths. Expected to go well on his seasonal reappearance in Cheltenham’s Grade 3 Henrietta Knight Handicap Chase, Teaforthree showed up well until the third last under youngconditional rider Patrick Corbett before lack of a previous outing almost certainly saw him blow up and fade out of contention, eventually trailing home eighth behind the lightly weighted winner Monbeg Dude. Back at his beloved Chepstow on December 27 and with his preferred testing ground all but guaranteed, Curtis’ stable star should go very well and it is no surprise to see him at the head of the market. Last year’s Welsh National winner Le Beau Bai is amongst a trio of horses bracketed at the 12/1 mark (together with the likes of Bradley and Michel Le Bon) with the likes of Paddy Power, and after already confirming his wellbeing this term with a victory over hurdles at Ffos Las earlier in the month his trainer Richard Lee is hopeful the nine-year-old can produce another bold show again in the contest in which he also finished third in the 2009 behind Dream Alliance. Giles Cross, a seven-length runner-up to Le Beau Bai last year, is priced up at 14/1, along with Monbeg Dude and Raz Du Maree.